We’re finally seeing wage growth. The change is so minuscule that you’ve got to squint. 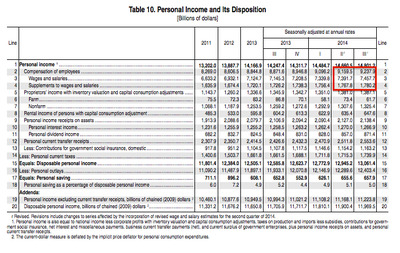 Here’s how personal income looks in this morning’s GDP report (full release here). 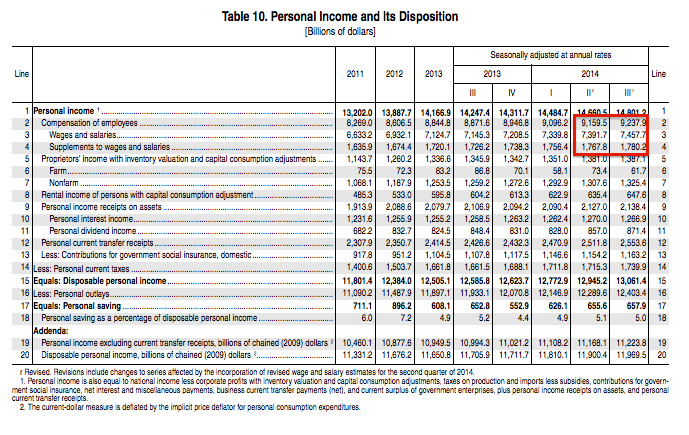 In addition to presenting revised estimates for the third quarter, today’s release also presents revised estimates of second-quarter wages and salaries, personal taxes, and contributions for government social insurance. Wages and salaries are now estimated to have increased $US51.9 billion in the second quarter, a downward revision of $US50.6 billion. These estimates reflect the most recently available wage and salary tabulations for the second quarter from the BLS quarterly census of employment and wages (QCEW). These data are more comprehensive than the monthly employment and earnings data that were used for the earlier estimates — the QCEW data include irregular pay, such as bonuses and gains from the exercise of stock options. It’s probably not enough for the Fed to justify raising rates anytime soon. Then again, there’s some evidence that some of this wage growth is going to the lowest rungs on the income ladder, which, coupled with falling gas prices, could have an outsize effect on consumption. And certainly two steps forward, one step back is better than no growth at all.